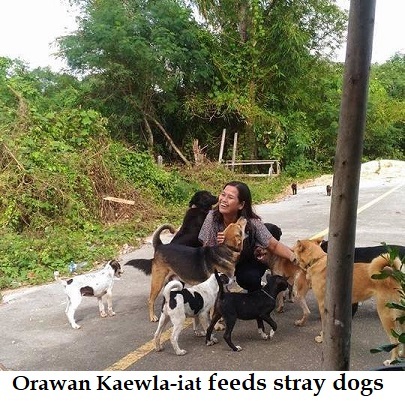 A kind woman in Thailand, Orawan Kaewla-iat, feeds the strays near her home to help homeless dogs. Unlike humans, where no good deed goes unpunished, the dogs are grateful to Orawan for her kindness. One pup named Tua Plu comes to Orawan’s place every day with his mom looking for food. But Tua Plu doesn’t come empty-handed. He always brings a gift in exchange for the food. The gift is usually a leaf or sometimes a piece of paper, but it’s the thought that counts. In the video below, you can see Tua Plu approach with a twig in his mouth, then places the twig down by the bowl of rice before he starts eating. There is also a longer video of Tua Plu carrying a yellow leaf in his mouth for several minutes. When he is offered a snack, the pup drops the leaf and takes the snack in his mouth, leaving the leaf on the ground, which shows the pup meant the leaf as a gift to the kind woman who feeds him. See also “Cat leaves flowers for kind woman“. This entry was posted in Animal gratitude, Animals, God's creation and tagged Orawan Kaewla-iat, Tua Plu. Bookmark the permalink. Thank you for posting these beautiful animal stories of kindness.. your website is a treasure.. Wonderful! I truly love dogs. I’ve always noted that I have a hard time with people who don’t like dogs. Awww, that is so beyond cute and sweet and wonderful!!!!!!!! God bless Orawan and her kind heart!